Mayville High School is a leading independent co-educational day school, in the heart of Southsea, with over 500 pupils on roll. We currently admit pupils within the 2-16 age range. We are a split site: the school has four large teaching sites and our playing fields are at Cockleshell, Eastney, which is less than a 10 minute journey from the School. We are situated near Portsmouth’s rich historic heritage, a stone’s throw from the Solent and close to the city’s cultural wealth. Founded in 1897 there is a strong emphasis on traditional disciplines yet Mayville adopts innovative teaching methods to help promote learning. Our size is our strength, we are big enough to offer pupils a wide range of opportunities yet small enough to treat each pupil as an individual. Class sizes are small, enabling each pupil’s individual learning needs to be fully met. To ensure that we provide a bespoke education to each child within the senior school we split the forms into two so that the pupils are taught in sets of around 12. This is an unparalleled staff-pupil ratio in senior school education. The defining features of a Mayville education have always been; a pastoral care system outstanding enough to nurture the individual child into gaining knowledge of themselves and an appropriate academic bite, the constant striving towards academic excellence tempered perhaps by the belief that true success is that magical combination of both ability and temperament which is refined over a lifetime. Mayville High School offers an excellent education for boys and girls. You will find here teachers who are passionate about their subject and who provide an education robust enough to enable the requisite success in public examinations but equally an education that will withstand the test of a lifetime, the best possible pastoral care that makes every pupil feel they are as important to the school as it is to them, outstanding extra--curricular provision, excellent facilities and, we hope, pupils who care as much about the success and happiness of their peers as they do about themselves. 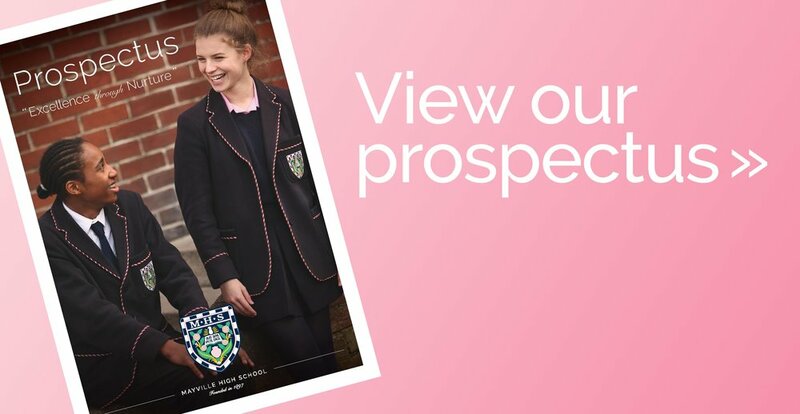 The school has always been an inspirational place where a remarkably warm, inclusive and caring ethos guides all pupils to achieve their very best. Children at Mayville flourish in a family style environment where they are part of a caring community and are taught to respect and support each other. You are warmly invited to visit us to see for yourselves the unique schooling Mayville has to offer.